One year after a plane carrying members of the Lokomotiv hockey team crashed in Yaroslavl, Russia, friends and family paid their respects Friday to those who lost their lives. 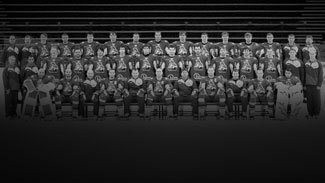 Forty-four people died on Sept. 7, 2011, including former NHL players Brad McCrimmon, Pavol Demitra and Igor Korolev. The club scheduled several events to mark the somber anniversary, which began with a requiem Mass for the dead at Yaroslavl's Assumption Cathedral before prayers at the city's main cemetery and a visit to the crash site near the village of Tunoshna for a memorial service. The day ended with an exhibition game featuring some of the sport's all-time greats. According to a story on the International Ice Hockey Federation's website, representatives of the families of almost everyone on the aircraft were on hand for the ceremonies. Only the families of Jan Marek and Demitra were unable to attend. Vera Korolev, the widow of Igor, resides in North York, Ontario, and spoke to the Toronto Star about what she's been through during the past year. She is in Yaroslavl with her two children to take part in the commemoration. "It was the worst day of my life," Korolev told the Star, recalling how the loss of her husband only got more difficult in the days and weeks after the crash. "It seemed that we could not get through this year. "Of course, it's been hard … but the families are all here to support each other. We all understand what each other is going through." The main public event during the day of mourning was a silent march along Moskovski Prospekt, the main road from the city center to the club's arena. Outside the rink, fans released balloons into the sky in memory of the players. Friday night, the tributes continued with a game featuring stars from Russia and the rest of the world. Those in attendance included KHL president Alexander Medvedev; Russian Hockey Federation president Vladislav Tretiak; and Wayne Gretzky, who is also in Russia to celebrate the 40th anniversary of the famed Summit Series. A host of other hockey legends, including Mark Messier, Brett Hull, Pavel Bure, Igor Larionov and Viacheslav Fetisov were also on hand. Before the game, a memorial jersey for Lokomotiv 2011 was raised in the arena -- the first of several monuments to the team planned for the city. "It's hard to believe it has happened," Larionov said, according to the Calgary Sun. "It still brings some chills to your body. An emotional night. I played a lot of games and (this one) is tough. When you know the spirit of (the Lokomotiv) team is here, for us and the fans it's ... a very emotional night." Lokomotiv opened the 2012-13 KHL season with a 5-2 victory in Novosibirsk on Thursday. Lokomotiv will play its first home game Sept. 16 against Atlant Mytischi. On the other side of the world, members of the Washington Capitals still felt the pain of the loss of their friends. "Of course it's a hard memory; it's very hard to remember," Alex Ovechkin, who knew Alexander Galimov, told the Washington Times. "Of course the guys and all the team is going to be in our hearts. But nothing you can do about it. You just have to think about them and pray." Capitals prospect Stanislav Galiev knew three players who died in the crash and said he is glad to see the healing process continuing in Yaroslavl. "They have a new team," Galiev said to the Times, "and there's going be like new life for the team."